Yesterday Ethan celebrated his 10th birthday. It is a milestone birthday because he went into double digits. Turns out there are a few milestone birthdays--10, 13, 16, 18, and 21. Unfortunately those are followed by the decade years with the magical 65 and 75 tossed in for good measure. It is hard to believe that he is 10 years old already--the time certainly has flown by. 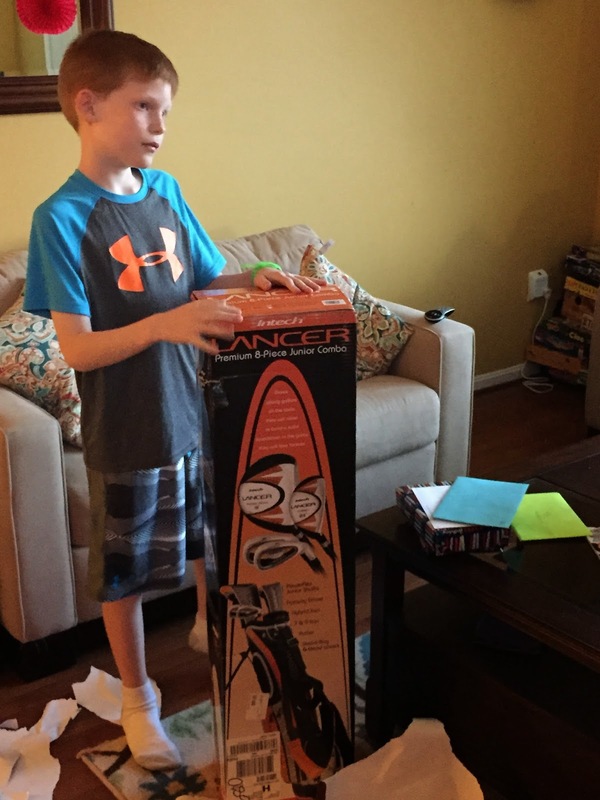 Although I know his favorite gift was the trip he revoked for an overnight at Great Wolf Lodge, my personal favorite was his golf clubs--I look forward to spending quality time on the golf course enjoying teaching him the game--not that I actually know how to play it. Growing up seemed to take so long when I was young and growing, but it happens so fast now that I am watching my children and now grandchildren pass each age milestone. I enjoyed singing Happy Birthday to him. And I also enjoyed him on his scavenger hunt to secure his final and most wanted gift. Happy Birthday E--may you always have joy in your heart. Would it be a Game, If no Fans were allowed?